This "Members Only" event is a great opportunity to find that rare, unusual, and elusive plant that you have been searching for. Annuals, perennials, hanging baskets, planters, shrubs, trees, conifers, daylilies, hostas, and more! Preview sale opens at 6 p.m., but some members begin to line up around 5 p.m. Cash, check, or credit card accepted. This annual fundraiser supports programs and plantings at Hidden Lake Gardens. 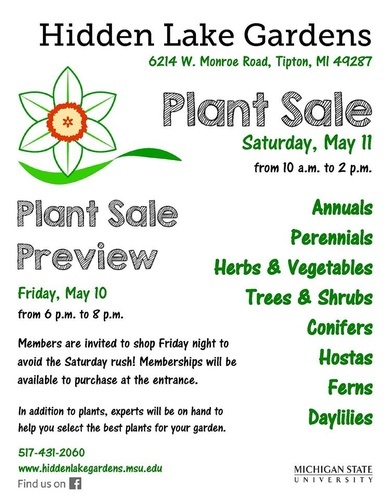 New benefit for members in 2019 - a 10 percent discount on plant sale purchases!